(CNN) -- Anders Hansen chipped in an eagle on his penultimate hole to take a one-shot lead after the first round of the European Open at The London Club in England on Thursday. Denmark's Anders Hansen made the early running on the opening day of the European Open. The Dane carded a seven-under-par 65 to head off South African Thomas Aiken, Peter Hanson of Sweden, England's Sam Little and Jyoti Randhawa of India. "Obviously at any stage it's always nice to lead the tournament, but the main thing is to be there on Sunday and give myself a chance, so that would be great," the world No.66 said. "A good start, so we'll see." Hansen's flawless round started on the 10th tee, claiming four birdies on the front nine for a 32 before picking up another shot at the sixth hole to move within a stroke of early pacesetters Aiken and Hanson. At the monster 608-yard eighth he sent a booming drive down the right of the fairway and a solid three-wood to the edge of the green before sinking a difficult chip shot. Hansen's heroics were almost overshadowed at the other end of the field as shock Irish Open winner Shane Lowry struggled on his professional debut. The 22-year-old, who triumphed 11 days ago as an amateur, signed for a nervy 78 to be joint 147th of the 156 players. "I felt a bit flat and I'm glad to have it over," he said. "It's the first day of many hopefully and there will be good days and bad days. "I just got off to a bad start, four over after six, and didn't feel myself to be honest. I knew it was going to be tough, it's not an easy course by any means." Young Australian Scott Arnold, top of the world amateur rankings last week, also struggled on his first outing as a professional, carding a 79. But they were in good company, as Sweden's world No.5 Henrik Stenson struggled with a 76 and former U.S. Open champion Michael Campbell of New Zealand continued his horror run with an 80. 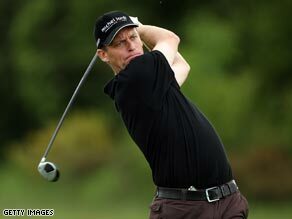 Hanson followed up his dramatic hole-in-one at a play-off in Monday's U.S. Open qualifying event at Walton Heath. "I think today's score had a little bit to do with Monday," he said. "I've been struggling a bit with my long game and that gave me a huge confidence boost. "It was a fantastic way to come into this, with people patting me on the back and saying 'Well done'." Nine players were tied a further shot back on 67, including England's Simon Khan and India's Jeev Milkha Singh.